Thanks to Russel Tarr for capturing me telling a story! My session at #PracPed18 was entitled Tell me a story! You can find the Slideshare below. In it, I shared some ideas about the use of stories and books in the languages classroom. Beginning by discussing why you would use stories, we moved on to choosing books, and then some ideas of how you could use stories in the classroom to enhance language learning. Finally we talked about how to write your own stories; this part was a little shortened so I have added some notes below. You’ll also find links to some helpful posts and bookmarks below. I hope those that attended found the session helpful, and those that didn’t feel able to ask questions! Please feel free to leave a comment on the post if you have questions or comments! 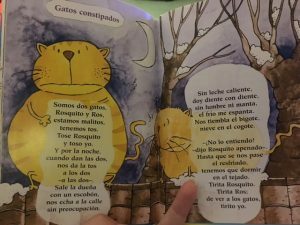 Pictocuentos website – stories told with widgets to support understanding. Talk for Writing – accompanying storytelling with actions and storymaps. Link to resources for El artista que pintó un caballo azul as a text to discuss diversity. The book I mentioned that was recommended and demonstrated by Nathalie Paris at Language World was called Poux by Stephanie Blake– check out the sketchnote of her session here, and follow her book blog and podcast here for more great book ideas! My primary language book collection, classified by language type and theme. The Storybird wiki has been shut down but you can access the links etc here. mostly Spanish with a couple of German ones. My Storybirds mostly Spanish with a couple of German ones. Blogposts on books on ¡Vámonos! – lots of posts including book reviews, ideas for using stories and how to write your own! Thanks for your participation and questions. Slide 18 – I skipped this one in my presentation as time was flying. This week, Merriam Webster shared a “time machine’ dictionary that tells you the words that were put into the dictionary during the year of your birth. I wrote a story using just nouns from my birth year, shared via tweet. This gave me the idea of giving children a list of words and challenging them to write a story with those words. A good way for more advanced pupils to practice verbs. I will share further when I have developed that thought! Just found a post I wrote 2 years ago and never published! It a companion to this post about Calming songs and rhymes about hands! I shared the Chocolate rhyme previously but I think it’s worth sharing again as it’s been so popular with Y2. And, as this post shows with ‘mariposa’, any other four syllable word works. It would work with cucuracha, elefante or even Barcelona! 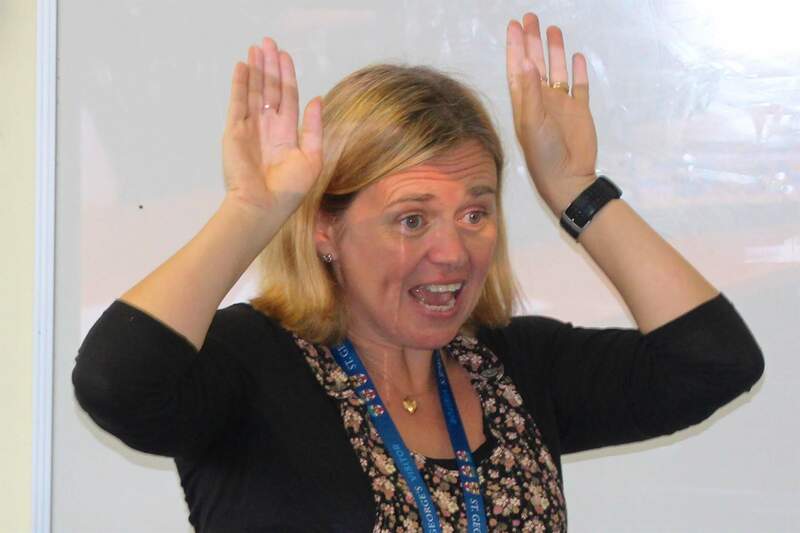 The clapping is the same as for Double double this this in English so pupils find it less tricky than you’d think! 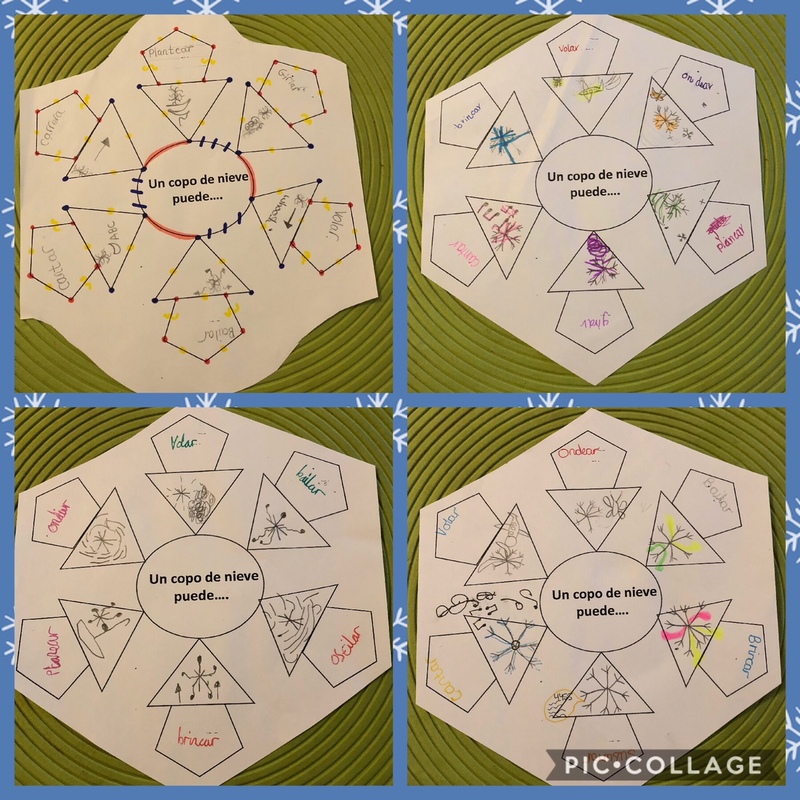 Spanish playground also shares El marinero que se fue a la mar (a sailor went to sea) and Por aquí pasó un caballo (a counting song) – more complicated but still fun! Today I had a ‘random’ lesson with Y6, one of those times in a two form entry school where I only have half the year group so need to do something different. Recent work on infinitives and (se) puede. 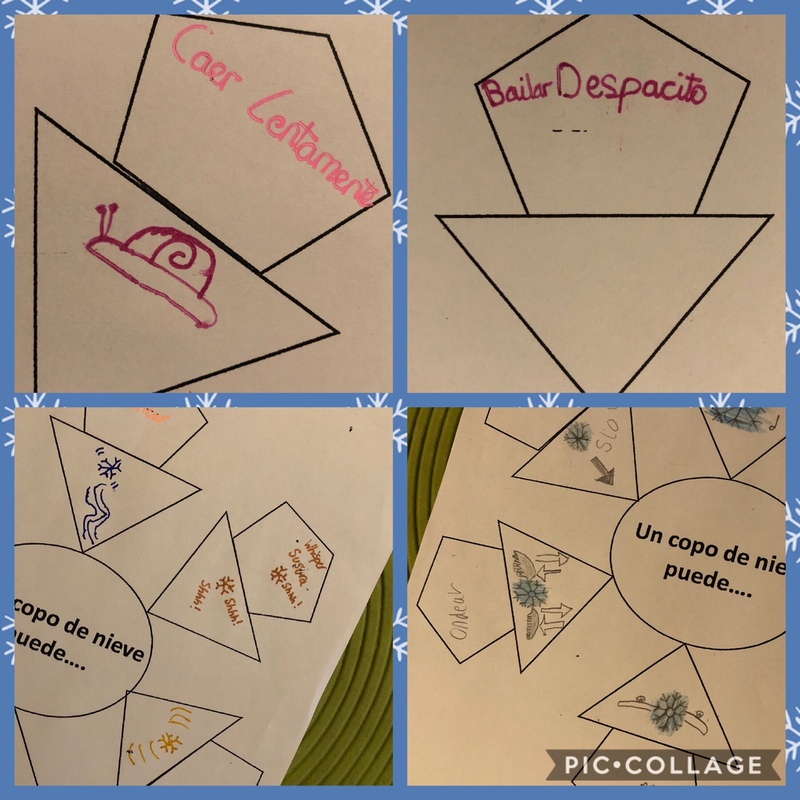 So I decided that this afternoon, Y6 would work on the poem Los mágicos copos de nieve that I’d downloaded from PLN. 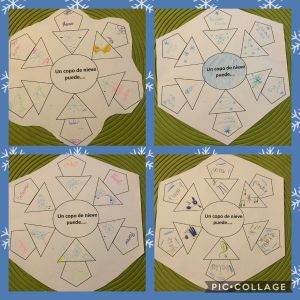 I removed the snowflake image and the header from the PPT slide so there was no clue to the topic other than the words and asked pupils to discuss in small groups what they thought the poem was about. They immediately picked up it was something magical; someone suggested it was about a magic carpet; a fair guess. Someone else had picked up blanco and suggested it was about nine white rabbits, misreading nieve as nueve. Another picked up ‘repaid’ meant fast and another group that ‘frío’ meant cold. Between them they worked out it was about snowflakes. We identified the infinitives, reminding ourselves that infinitives in Spanish end with -ar, -er or -ir, and tried to deduce the meanings. Bailar and cantar had been met before. 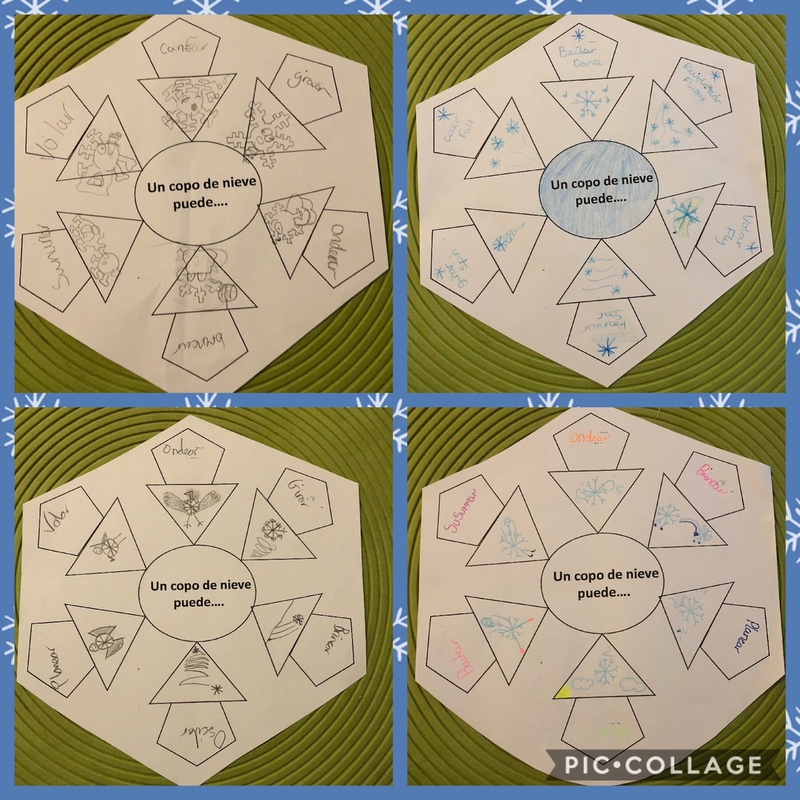 We linked girar to gyrate and gyroscope, and I was able to give a clue to volar by linking it to ‘un avión’ that we’d met last week in a lesson on transport and ‘una mariposa’ that we’d met when we drew mini beasts with finger prints: un avión puede volar; una mariposa puede volar’ Planear was a bit trickier but a dictionary soon helped! We read the poem and then I let the pupils loose on the dictionaries with their imaginations. We only had 35 minutes but you can see in this post some of the outcomes. I loved the illustrations pupils used to show the meaning of the verbs. I particularly liked the ones with faces, and the shhh for susurrar! If you want to download the resource, it’s available here. On my trip to London on Tuesday I paid a flying visit to the fourth floor of Foyles where all the language books are found. Although I was limited in the time I could spend there – 25 minutes! – and I imposed a spending limit on myself too, I still managed to come away with a couple of books. 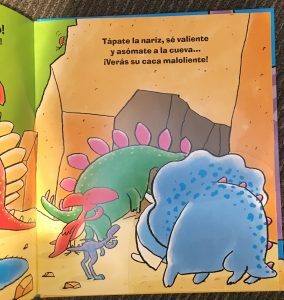 Sería ………. – It would be ………. This could be colour and character. 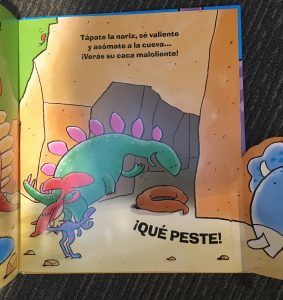 Tendría……….. – It would have …………… Here they would describe the pet; a tail? a big head? Le compraría … – I’d buy it ….. Clothes? Food? Toys? Comería… y bebería……. – It would eat…. and drink ………..
Viviría …………. – It would live…. Very simple and easily done with some dictionary skills and a bit of imagination, and easy to extend with some conjunctions, negatives and so on. There are lots of other dragon ideas and resources around. Ramón el Dragón is a lovely song about a dragon called Ramón (obviously). 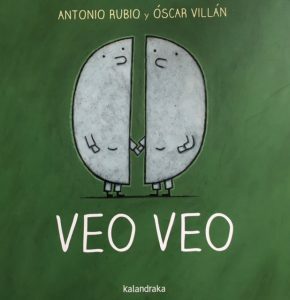 It rhymes and has a very simple chorus, telling the story of Ramón’s very simple life. You can see the lyrics on screen but can read it as a class poem using the lyric sheets here. And I like this story about El cumpleaños del dragón as it is simple, is in Spanish with English subtitles and has a message about having tantrums! 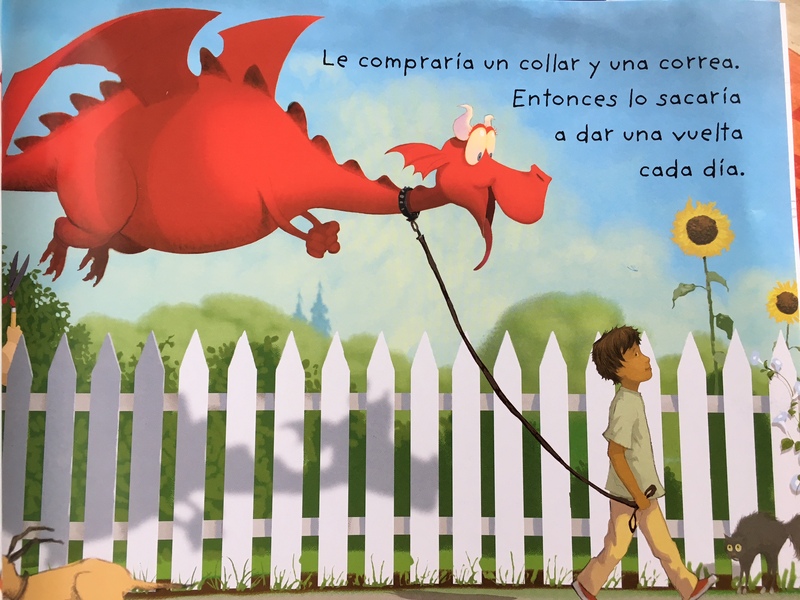 And if you’re looking for a story to read that has a message, I liked El dragón que escupía chocolate. 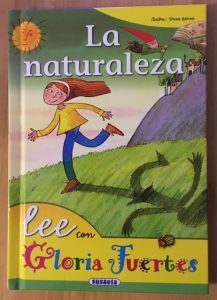 And Nattalingo recommends El dragón frío on her blog. 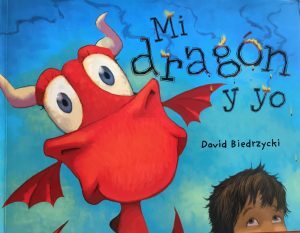 There are lots of ideas too; Janet Lloyd’s Primary Languages Network shared some excellent ideas based around How to train my dragon for world Book Day last year. 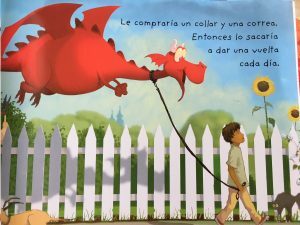 Erzsi Culshaw shared some clothes peg dragons to celebrate San Jordi. 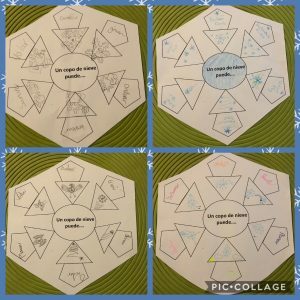 And Ruth Kidd has shared some lovely French triaramas of her Y5s describing dragons on the Languages in Primary School group. In fact, if you search ‘dragon’ on LiPS you’ll find several more ideas! Hope you found that helpful. It certainly kept me occupied during a rainstorm! Another post about books I bought in Bilbao. I’ve long been a fan of Gloria Fuertes, in particular her poem Doña Pito Piturra which I’ve written about before and so has Erzsi Culshaw. I’m trying to include more whole class poems that we read and recite together in light of this and also as a way of supporting the English curriculum which requires learners to recite poetry. 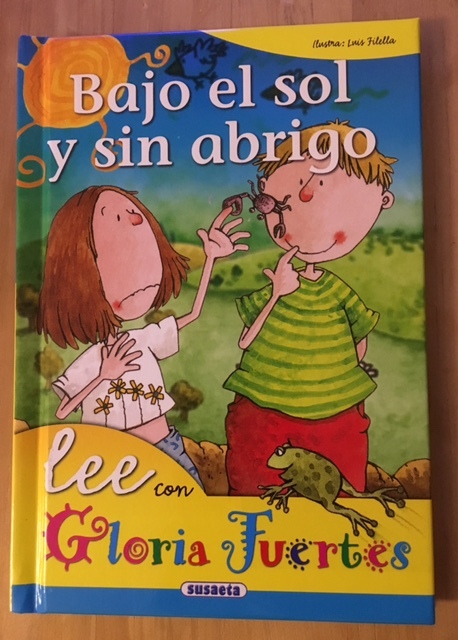 So when I saw a series of books called Lee con Gloria Fuertes I decided to purchase a couple. It was hard to decide which to choose but I settled for one on nature and one on weather. Below are my favourite poems from the books. 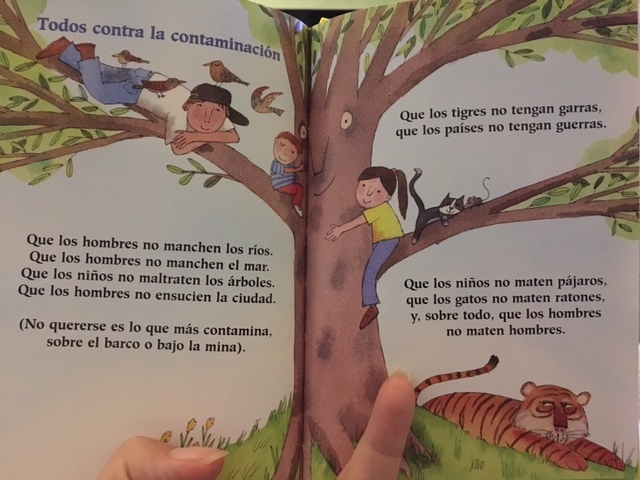 The first is a list of wishes entitled Todos contra la contaminación which fits well with the eco focus at both my schools and would work well as a reading/drawing activity with learners choosing a line or two to illustrate. The second poem is called Gatos constipados and is about two poorly cats who get thrown out for coughing too much! There are lots more books in the series so I may well purchase more in the future. You can find more poems specifically for children by Gloria Fuertes here and others here. In this post there are a number of downloads of her poems along with links to other Gloria Fuertes poems including here (poems about time) and here (poems about professions). You can find a PDF of more of her work here plus here which also has a reading guide. 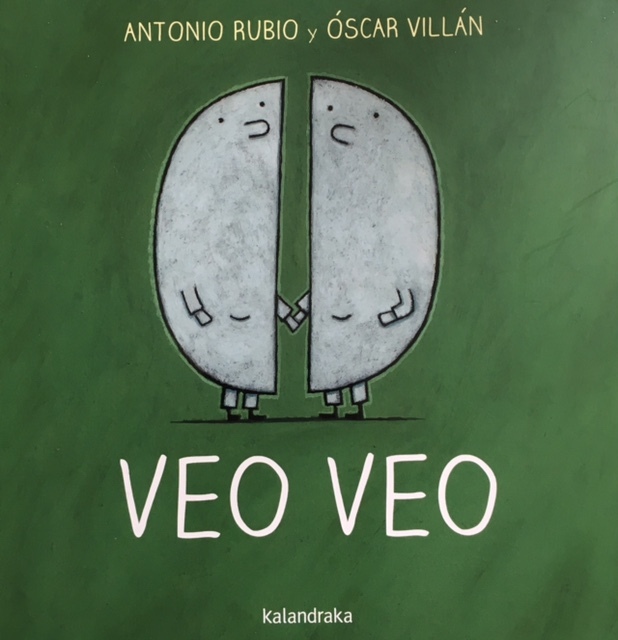 Another purchase on my travels to Bilbao was this book entitled Veo Veo. It’s a really simple board book about two ‘lunas’ or moons that go for a walk to the park and play I spy. I liked it for the simplicity of the languages, for the repetition and also for the simplicity of the images. So how would I use it? 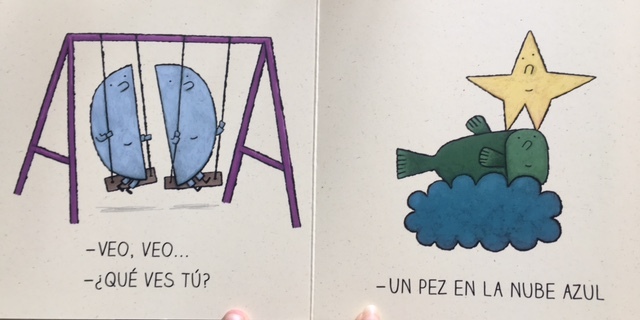 A book to read as the introduction to a guessing game: a number of images on the board and the leader says Veo Veo to which everyone answers ¿Qué ves tú? (the refrain in the book) before someone guesses which picture has been chosen. This limits the number of vocabulary items that need to be known to play the game. As a variation on the above, the leader could say what letter the item begins with Empieza con … or say what colour it is Es (de color) …. or give other simple clues. As above but using the whole rhyme that I shared in a previous post some time ago. (Sadly at the time of writing the link to the East Riding materials in the post is broken and I haven’t managed to track down if they are still in existence. EDIT: Now updated as I’ve found it!) It’s a call and response with the leader saying the parts in red and everyone else responding with the blue words before someone guesses. Getting away from the song/game Veo Veo, I also thought that the book would be a good stimulus for some writing. 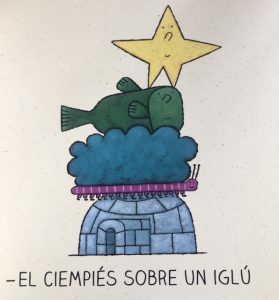 Una estrella sobre un pez. Un pez en la nube azul. 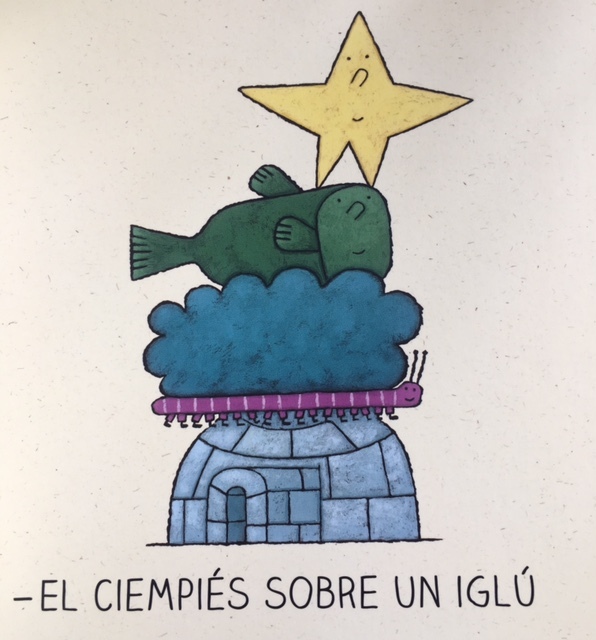 La nube sobre un ciempiés. A little more complex would be to add some time conjunctions primero, luego, después, finalmente etc to sequence the items. 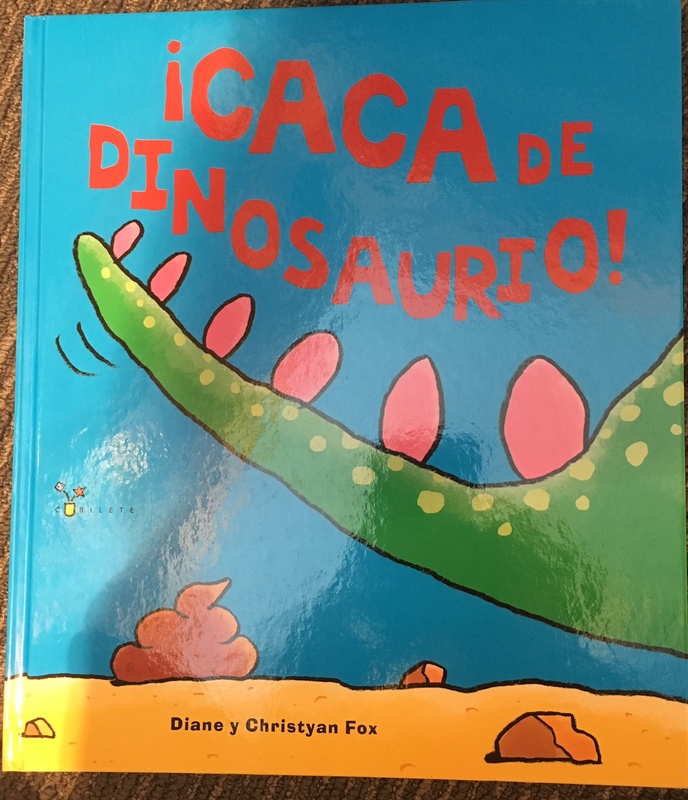 And to add extra difficulty pupils could choose their own items to arrange and describe, perhaps not restricting themselves to placing them on top of each other but also placing them a la izquierda or a la derecha, al lado de, entre etc to introduce further positional prepositions, and adding a verb to the sentence; for example, Hay un sacapuntas debajo del arco iris or La silla está al lado de la naranja. 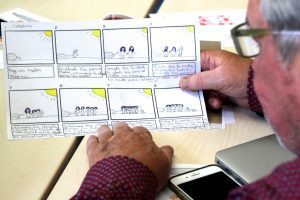 The texts from the above activity could be used for listening activities with pupils sat back to back, reading out their description for the other pupil to draw before comparing images at the end. Another listening activity would be with the teacher describing a stack of items (as in the book) from a bank of given images and pupils arranging the images according to the description. Or it could be a reading activity involving drawing or sticking the items. Or if you’re feeling adventurous and have a big space, what about giving instructions to place larger items in a tower (being careful of H&S of course! ); this might be a good idea for a smaller group or club. Una vaca debajo de una butaca. Un payaso en un vaso. Un sartén sobre un tren. 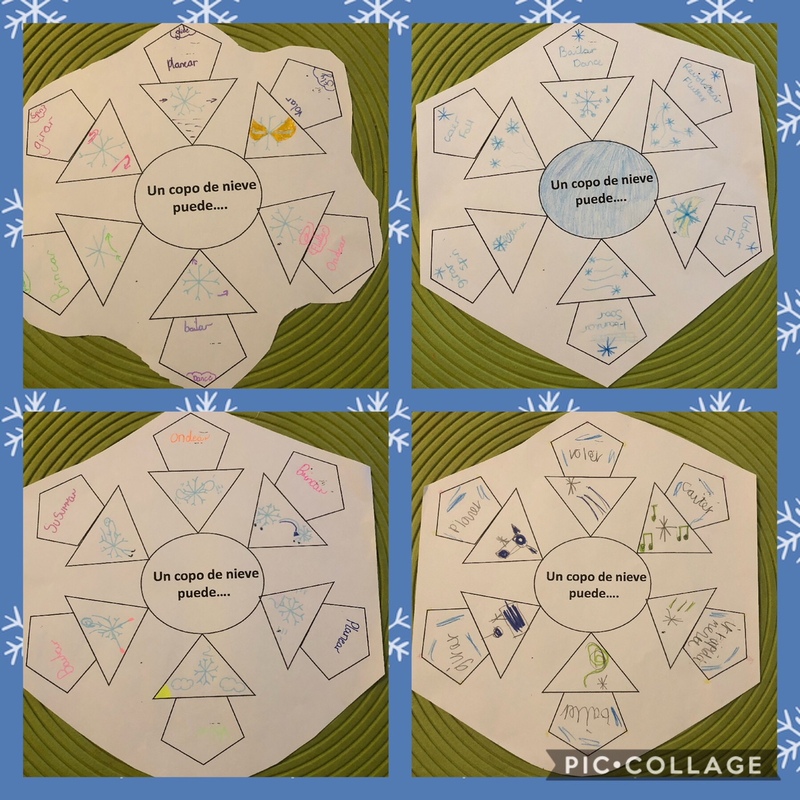 There’s a PDF of rhyming words in Spanish here which is helpful as it gives meanings, and this post gives a download of some rhyming cards as well as more suggestions on rhyming word activities. More advanced learners could use Buscapalabras, but the meanings are not givens it’s hard for a (near) beginner to choose suitable words for their sentence. And finally, why not have pupils making their own books – using an app like BookCreator if you want to use technology or a mini book if you want to go ‘analogue’ – using all of the above, and perhaps having the own characters. 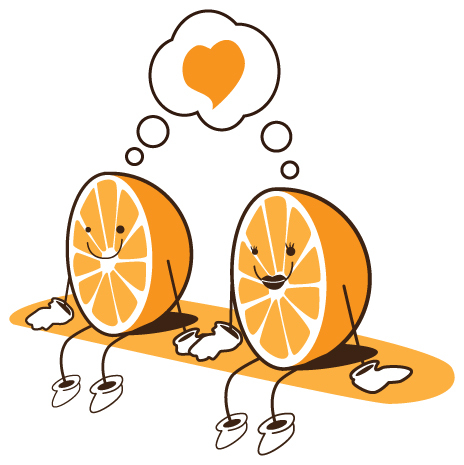 So, there are my ideas. Have you got any to add? Leave a comment below. 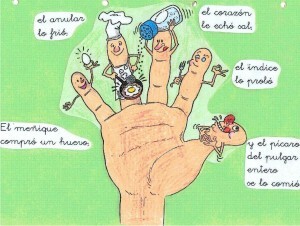 Las manos – calming Spanish songs and rhymes about hands! Ever since #ililc5 when Janet Lloyd introduced us to this French song for gaining attention and restoring quiet in the classroom, I’ve been searching for a Spanish equivalent. So far I’ve not found one but it got me thinking about using songs and rhymes to create calm. 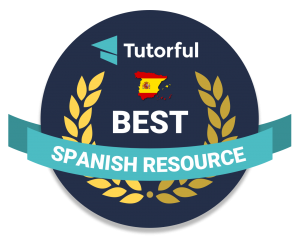 I have to admit that I tend to use them to either create excitement and action – see posts about La Vaca Lola and Choco Choco la la, two of my favourite songs, or to teach vocabulary – for example, see these posts on Yo quiero ser by Nubeluz or La finca del Tío Ramón and Hojas Hojas that I subtitled using Amara. However, I began to use this song to start all my lessons in KS1 at the start of the year and noted that as well as signalling the start of the Spanish lesson, it focused us all and calmed everyone down. Part of the appeal is the routine, but I also think that the actions help. And as I was searching, lots of the songs and rhymes I found were either about or used your hands so I thought that warranted a post! I love this collection of songs which could be used separately or as a whole! Each is only about 40 seconds long and all can be sung/acted on the carpet as well as in seats. Some helpful (opposites) vocabulary too – content/triste, arriba/abajo, abre/cierra, allí/allá. I also like the way that it starts very calm and then gets a little more animated but not too much! You can find the lyrics for this song here. This is one of the songs included in the above video – I think the ‘band’ will be very popular, and it’s still very chilled with the saxophone and calm actions! Saco una manito. La hago bailar, / I take out one hand. I make it dance. La cierro, la abro y la vuelvo a guardar. / I close it, I open it, and I put it away again. Saco la otra manito. La hago bailar, / I take out the other hand. I make it dance. Saco las dos manitos. Las hago bailar, / I take out two hands. I make them dance. Las cierro, las abro y las vuelvo a guardar. / I close them, I open them, and I put them away again. A very very simple song in which you touch each finger together one after the other then all together. This song about a shoemaker is the Spanish equivalent of Wind the bobbin up with arm rolling forward and back, pull, pull and then ‘pan pan pan’ as you gently hammer the shoe. I’ve seen this rhyme before but had forgotten about it. A nonsense rhyme, but with hand actions that require some concentration. A calm song for saying sí and no, firstly with a finger, then a foot then the head. Y este dedito se escondió. Y esta cabeza se escondió. Another song about hands with lots of actions to copy! se sacuden con gran fuerza y después se enrollan de aqui por allá. suben por una escalera y después se tiran por el tobogán. If you’re interested in more traditional action songs, have a look at Diversión con juegos de mano which includes Dos manitas, diez deditos and Los deditos. Continuing on the original thought of bringing the class together, this might work as I’ve yet to find a class that don’t want to wiggle their bottoms given half a chance! Other rhymes using your hands include Los dedos de las manos and there are several more here including Dedo pulgar (the Spanish version of Tommy Thumb) and Cinco ratoncitos in which one less finger or ‘ratoncitos’ comes out each time to play! And the ever helpful Spanish Playground has some other suggestions too. I’ll try some of these out in class and let you know what happens. PS Over the last two weeks Y2 and I have been exploring world dance and this week we did some ‘flamenco’ arm work. There was utter concentration so perhaps that’s another avenue to explore! Music for Los vocales D.I.S.C.O. I also mentioned Tellagami, Pic collage and Book Creator app. Check out this post for more details! Again, if I’ve forgotten to upload something that I promised, please let me know! My second session at #ililc4 was entitled Something old, something new and concerned the new 2014 curriculum. My presentation is below, and I’ll explain briefly what I said as I couldn’t attach the notes without making the Slideshare look ugly! As I explained on the day, when you have to submit your idea so far in advance and aren’t entirely sure how your idea will pan out, it is quite tricky to come up with a witty/apposite title. 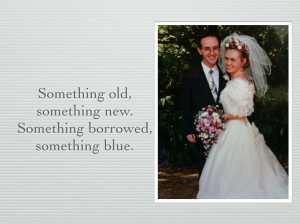 My choice of Something old Something new was mainly because I envisaged sharing some old ideas and some new ones plus some borrowed from others. However, as I came to think in more detail I began to think more about weddings! Primary languages have had a bit of a torrid love life, being loved and then rejected by the primary curriculum, nearly getting up the aisle in 2010 but being jilted at the last moment when all was going so well. So I set out to explore the ‘prenuptial agreement’ (or Languages Programmes of Study at KS2), how we can make this ‘marriage’ work, how to convince those that are nervous about married life and how we’ll keep the spark alive. So I began by looking at the Programmes of Study, highlighting parts of the document that I found interesting. 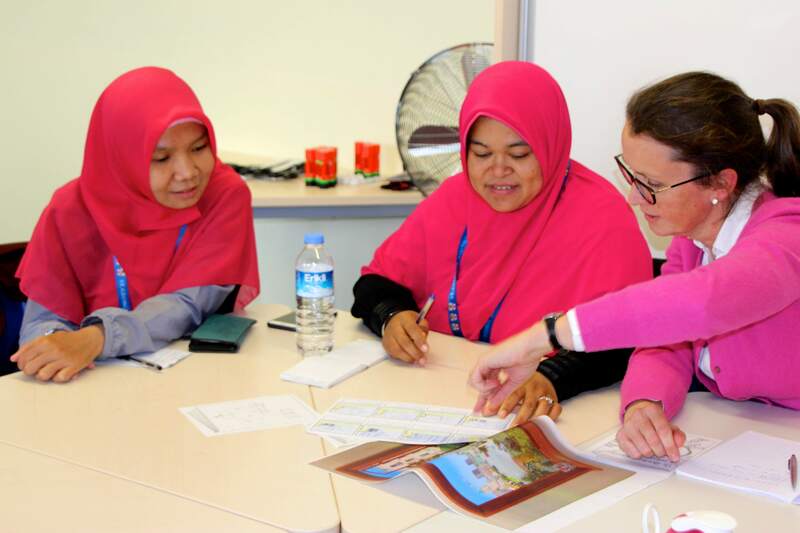 Purpose of study – Intercultural Understanding is still really important – it’s a vital part of language learning. Providing learners with building blocks AND mortar is key if they are to be able to express what they want in the foreign language. And ‘great works of literature’ doesn’t mean Don Quijote de la Mancha, A la recherché du temps perdu or Mein Kampf at Year 3; poetry is great literature and we regularly use an extract tom Machado in Year 5 as stimulus for writing. Aims – It’s about a balance and variety of things; a breadth of experience that leads to progression. No arguments there! Subject content – I highlighted that whilst it says ‘substantial progress in one language’, this does not mean that looking at other languages is precluded; in fact, I’d positively encourage it as making links between languages is a vital language learning skill. 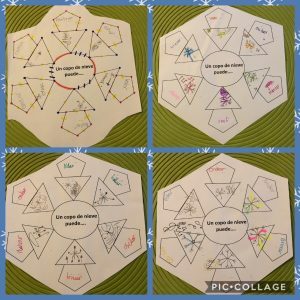 We discussed how a balance of skills can be achieved when some are more comfortable with speaking activities than the written word which seems more ‘serious’ and permanent. And we mentioned ‘the grammar question’ – it’s not such a bad thing! Nor is looking at languages such as Greek and Latin; very useful for understanding the formation of languages as I discovered on my year abroad at Universitat de les Illes Balears. Finally in this section we thought about laying those foundations for KS3. I referred back to a presentation I’d made at Language World called Bricklaying for Beginners and how bricks need mortar, and how it’s not a wall that needs demolishing at KS3; reinforcing but not knocking down! I then took each ‘pupils should be taught to..’ statement and split them into listening, speaking, reading, writing and grammar, suggesting ideas and activities that might meet them. books are brilliant – not just fiction though! Non fiction is very popular with boys and also is great for linking to other curricular areas: going back to my analogy, this ‘marriage’ is about give and take! If you can’t find suitable books, make your own as with my Storybird ¿De dónde viene el yak? learners can decode more complex texts without knowing every word if you provide them with the confidence to do so, embed language learning skills and discuss how languages work from the very start. writing doesn’t have to be in a book; whiteboards, post-it notes, mini books, Padlet, labels, paper chains, posters, your partner’s hand; they all count! structuring and scaffolding is fine – trapdoors are great as starters as is making human sentences and physically rearranging words. The Human Fruit machine with 3+ learners holding a large dice with 6 images of nouns/adjectives/verbs etc on them and spin is a great way of making make random sentences and exploring how you can substitute words in existing sentences to make new ones! I loved grammar at school; I liked the logic of it all and the patterns. So why not exploit that and make verb flowers, grammar songs and raps, dice games and so on. Use highlighters/colour to clarify grammar ( I lived by my red=accusative, green=nominative and blue=dative when learning German) be it nouns, adjectival placement, verb endings/groupings or spelling. Use activities that are used in other areas of the primary curriculum; learners up level sentences in Literacy all the time so why not in the foreign language? 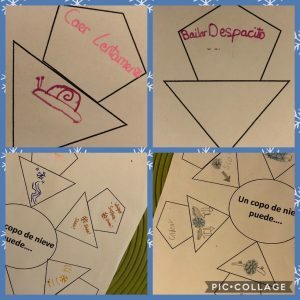 Word pyramids starting with a word and extending to a complex sentence at the base? And card sorting activities too. So that’s the session in a (pretty big) nutshell! 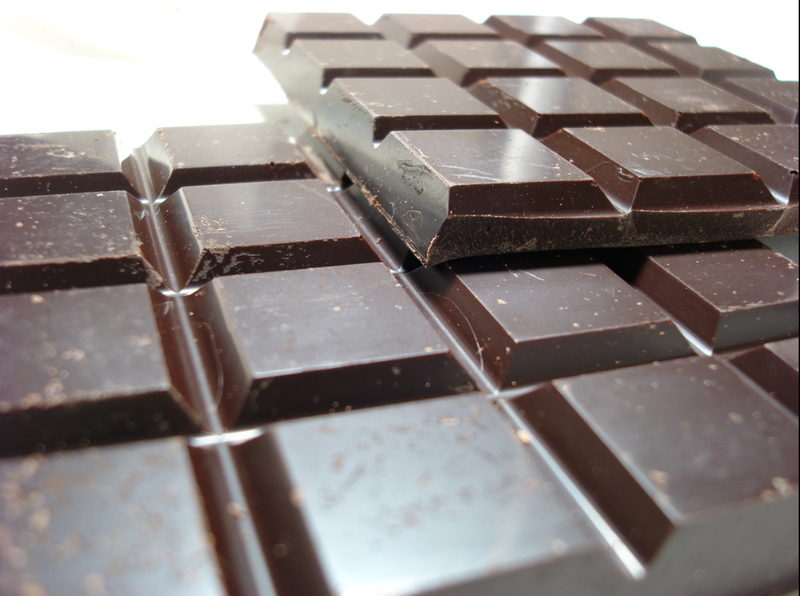 As if we’re not fed up enough of it by now, I thought I’d share a few simple activities on the theme of chocolate! Actions – count on your fingers for the first 4 lines then rub hands together to mix the hot chocolate with the molinillo. I like this rhyme as it’s simple, has actions and allows a bit of cultural explanation about chocolate originating as a drink in South America and being brought over to Europe by explorers. It can also be played in pairs as a clapping rhyme. 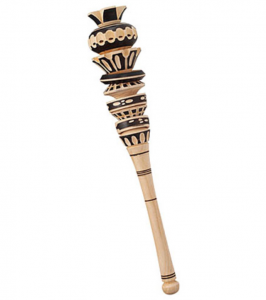 Try it – it’s quite tricky and great for coordination!